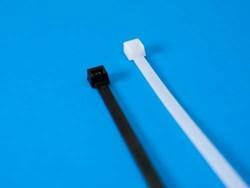 Standard 50 lb cable ties or zip ties are among the most popular cable ties currently being sold. The one piece construction allows for consistent performance and reliability. They offer the perfect solution in a wide variety of applications in industry, wire bundling, and cable management. Tensile Strength – 50 lbs.